DESCRIPTION: Major price reduction! 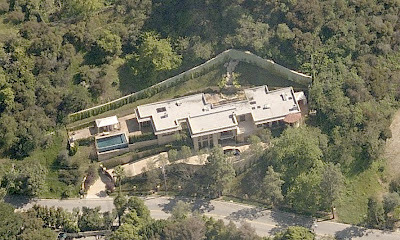 Spectacular celebrity owned gated B.H. estate. Private. Exclusive. Showcase prop. built in 2003 & just completed w/ major renovations, including all new designer interior finishes. No expense spared. Spacious 4+6 w/ elevator & fab views. Huge chef's kitchen. Romantic master w/ walls of glass. Infinity pool/cabana/BB center & multiple patios w/ gorgeous resort style grounds & waterfall. Grt. for entertaining. For the most discriminating clients seeking the ultimate in luxury and privacy. YOUR MAMAS NOTES: Praise Jeezis! The Rev. Tim Storey, a man who devotes his life to ministering to rich, famous, and spiritually needy folks like Dog the Bounty Hunter, has finally sold his luxurious and large house in the Hollywood Hills. After sitting on the market for such a long time, the Big Man in the Sky has finally seen it in his wisdom to provide Mister Storey a buyer who property records reveal paid $4,535,000, more than $1,000,000 than Rev. Storey paid for the house in 2003. Hallelujah! Your Mama wonders how much of his real estate windfall the Reverend will be tithing this Sunday. i really like this house! This house is across the street from Beverly Hills on the lowest section of Loma Vista, practically in the valley! If it were in BH it would be in Trousdale Estates which only permits one story construction. I like the house. But it ain't in Beverly Hills. Where do all these American religious types get all their money from? Vicars in the UK are usually very poorly paid - but then most of us don't go to church. So it is in Beverly Hills? You mean there are anons posting here that don't have a clue what they are talking about? Wow. Who would have thought. Yes, it is in Beverly Hills. I think some people are confusing Beverly Hills and the Beverly Hills development called "Trousdale Estates". Loma Vista runs through Trousdale then continues WEST (not north) further into Beverly Hills. One would have to take Loma Vista to where it connects with Bowmont, make a right (north), continue up the hill to Mulholland, then start down the other side of the hill before hitting "the valley".